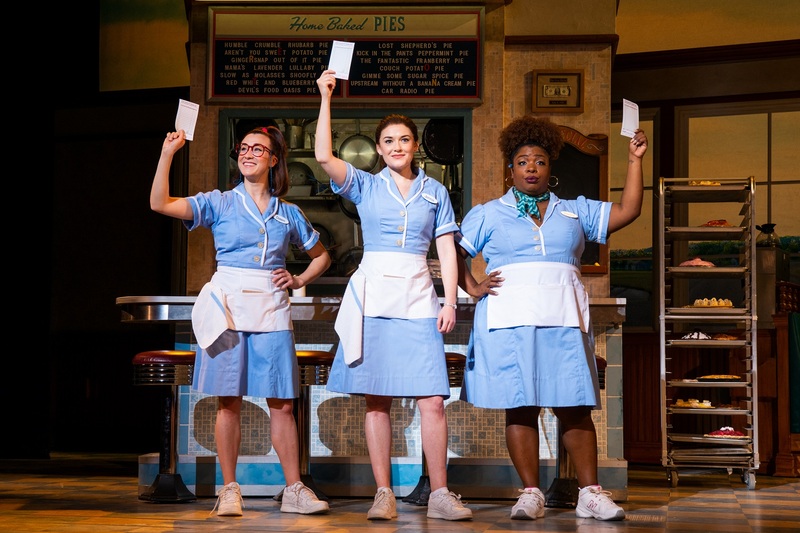 Waitress is Innovative, Sassy, Thought-provoking, Joyful – and Not to be Missed! If you smell a whiff of a pie baking in the lobby of Altria Theater when you see Tony-nominated Waitress, don’t be surprised. After, all pies are a main storyline in this funny-yet-dramatic production. Based on the 2007 film of the same name, the musical is as complicated as it is comic. The story revolves around Jenna, a waitress who bakes all sorts of pies at Joe’s Diner. She names her pies according to her mood or what she’s going through at the time. My Husband’s a Jerk Chicken Pot Pie is one example. Jenna’s life is anything but happy thanks to her husband, Earl, an abusive, controlling jerk (as mentioned above), who demeans her so he can feel better about himself. Jenna wants to escape Earl and a failed marriage when she finds out she is pregnant. Blend that together with an attractive new doctor in town, Dr. Pomatter, who Jenna meets for the first time when she goes for her first pregnancy appointment. The connection between the two is immediate and ultimately life-changing. He becomes her soul-mate – even if just for a little while – and helps Jenna find her voice and eventually the courage to make a better life for herself. storyline, but let’s just say extramarital affairs, online dating, and torrid romance all add to the comic aspect of the show. Waitress skillfully blends tense dramatic moments with lively comic touches to cast some light on a serious subject. In fact, some of the comic moments are priceless and laugh-out-loud funny. You do want to go into this production with an open mind, as there are parts that might be uncomfortable. While Matt DeAngelis plays Earl, a character you immediate loathe, he brings realism to the role that amplifies the verbal abuse and injustice Jenna deals with in her marriage. He makes you understand the character is broken in a very dark way. Although Earl never strikes Jenna on stage, that tension exists in their scenes. When it comes to the talent on stage, it’s quite amazing. And it should be, based on the credentials of the cast. There isn’t a weak link on stage. And, while you might relate to some characters better than others, you can’t deny their skillful performances. Maiesha McQueen as the sassy waitress Becky immediately becomes your best friend. Her comic timing is spot-on and her voice resounds across the theater. Jessie Shelton as Dawn, the mousy, introverted waitress of the trio, turns up the comedy when she meets Jeremy Morse who plays Ogie, a bounce-off-the-walls character who steals the stage every time he walks on it. Morse is responsible for some of the loudest laughter of the night. He’s fantastic. Steven Good as Dr. Pomatter is a master at both the comic and tender moments his character has with Jenna. And, it doesn’t hurt that he has a heavenly voice. Christine Dwyer, who by the way played Elphaba in Wicked when it last came to Richmond, has a voice that fills the room and energizes the story line. Her vocals are stunning. Dwyer explores Jenna’s personal struggles and brings them to life in a genuine way that is very relatable. 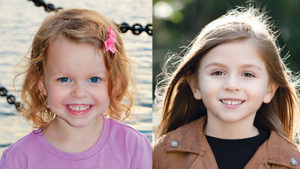 Like her fellow waitress Becky, you could see Jenna as your best friend, always there to help. And don’t discount Dwyer’s penchant for comedy, it’s perfecto. The only drawback to the night was acoustics or the sound system, something I’ve referred to in other reviews. One of the two or a combination of both made it difficult to hear all the words in the songs. Many of the folks around me had the same comment. Waitress is innovative, sassy, spunky, thought-provoking, and joyful – all at the same time. If you want to bring the kids, I can recommend it for ages fourteen and up, but expect some conversation after the show. It’s a great evening of entertainment! See it before it leaves town. 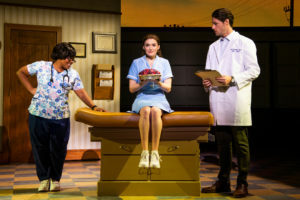 Waitress runs through Sunday, February 17, at Altria Theatre. For showtimes and tickets, visit Broadway in Richmond.